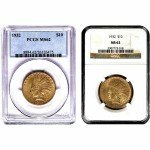 Customers: these coins will be certified by the PCGS OR NGC and graded as MS62 condition. 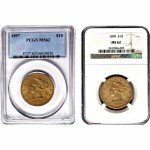 Coins will be from years of our choice, all of which will range from 1856 to 1889. 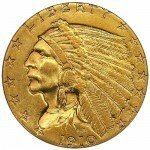 Because of its artistic and historical significance, the Type III $1 Indian Gold Dollar Coin has been a longtime favorite among coin collectors. It was originally released by the United States Mint in 1856 as the final artistic revision of the Indian gold dollar. 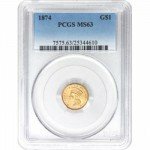 Unfortunately, it would also be the last genuine gold dollar coin to ever be produced or circulated in the US due to the Act of September 26, 1890. 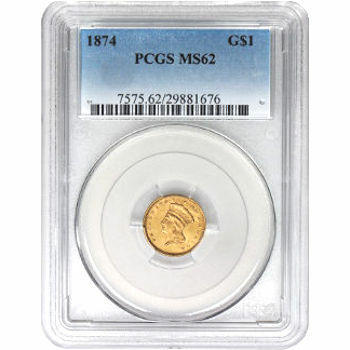 Each Type III coin included in this collection has been officially evaluated by the NGC (Numismatic Guaranty Corporation) or the PCGS (Professional Coin Grading Service) with a MS62 (Mint State 62) grade. Coins designated with a MS62 grade appear worn due to hairline and contact marks, but are still considered to be in acceptable condition. 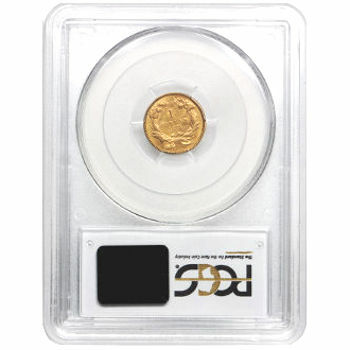 In order to prevent any further deterioration, each coin has been kept sealed in either a NGC or PCGS certified coin slab. The artistic revisions made to the $1 Indian gold coin symbolized the new sense of identity that was emerging within the United States. On the obverse of the coin, Liberty has forgone her classically inspired tiara in favor of a stylized Native American headdress to represent the new cultures that were being integrated into the nation’s identity. Similarly, the name “United States of America” has replaced the original border of thirteen stars to acknowledge all of the states instead of just the original 13 colonies. Equally impressive revisions were made to the reverse side of the coin as well. Instead of merely using a generic wreath to acknowledge the agricultural industry as a whole, coin designers altered the wreath to include a variety of crops, each in honor of a different farming region. The final type III design reflects our country’s deepening appreciation of all the cultures and industries that were contributing to its growth as a nation. With such a rich historical and artistic background, this Type III $1 Indian Gold Coin is certain to become a treasured part of any collection. If you require any information regarding this particular item, please call us at 888-989-7223. Our staff is also happy to assist you through live chat or email.